Product Review: Peanut Butter & Co. I recently reviewed Beth Aldrich’s book Real Moms Love to Eat and I received an awesome goodie bag for being a part of the Real Moms Love to Eat Food Affairiate Program. The bag contained a large selection of many products that are mentioned in the book or tasty treats that are Real Mom approved. So, I will be sharing my reviews of these products with you over the next few days. I hope you enjoy! 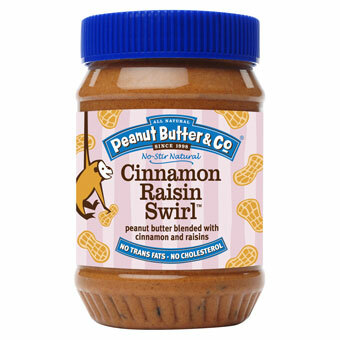 Company: Peanut Butter & Co.
Our all-natural peanut butter with cinnamon and raisins. It’s like spreading your peanut butter on cinnamon raisin bread—without the bread. It contains no cholesterol, no trans fats, no hydrogenated oils, and no high-fructose corn syrup. It is also gluten-free, certified vegan, and certified kosher pareve by the Orthodox Union. The shelf life is 6 months after opening, if stored in a cool, dry place. My Thoughts: My very first thought was to try these on celery. I love adding peanut butter and other things to celery, so I was sure this would be good. Boy, was I right! This was absolutely delicious! It is a peanut butter blend with cinnamon and contains small chunks of raisins. We do not eat a lot of peanut butter, but this has become a favorite in our house. It is a great go-to afternoon snack to add to your veggies or whatever you desire! A+ from us! You can also find information on pre-ordering the book and information on a giveaway at the website above. I love peanut butter on celery, too. This, I’ll have to try. Thanks. This sounds like something my husband would love. I love this Peanut Butter & CO brand. My favorite is the crunch time. I love it on just bread, crackers, and even make peanut butter cookies with it.